Blue Chip are yet another long line of UK stand up paddling converts – owner Brian Johncey having been involved in watersports for many years. 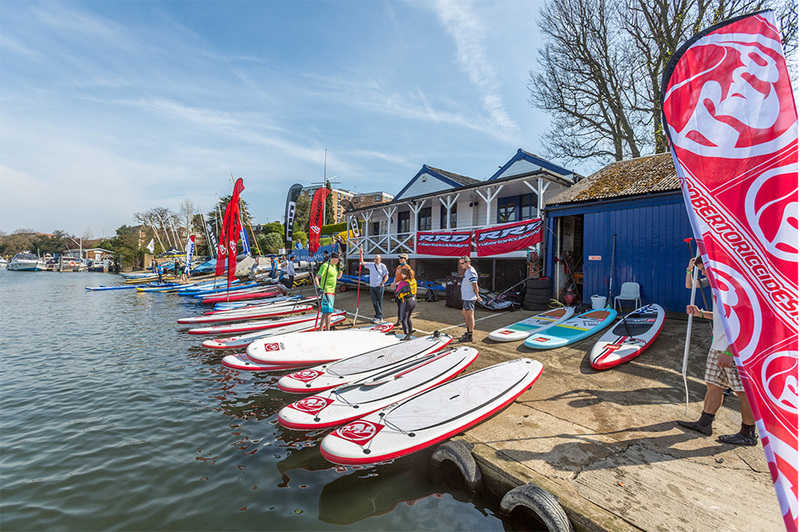 When SUP came on the scene Brian and Blue Chip were keen to get involved and over the last few years the Blue Chip SUPer Club has become a stalwart of the UK’s stand up club scene. 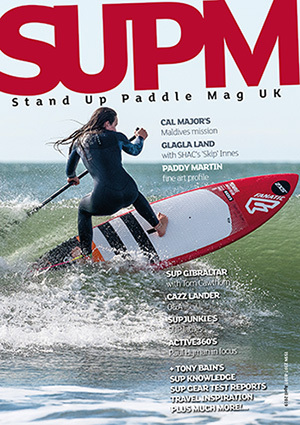 SUP Mag UK caught up with Brian for a natter on all things stand up paddle boarding and Blue Chip SUP. Firstly tell us a bit about yourself; you’ve been in the watersports industry for quite a while. When did you discover stand up paddling and what made you realise the potential the sport has? I have been in the watersports industry since 1970 when I first started repairing surfboards and kayaks. 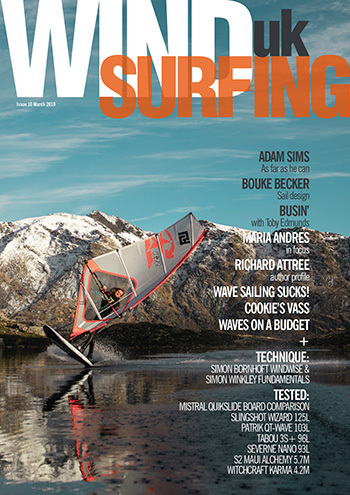 I started Blue Chip Board Store in 1980 predominantly as a windsurfing store and repair centre. I first discovered SUP in Tobago in 2005 when I had a go on what I can only describe as a very big surfboard and a double bladed kayak paddle. We used one blade as the handle and wobbled off around the bay. At that stage SUP was seen as just for catching small waves and although I enjoyed it I had no thought of stocking or continuing SUP back in the UK. Then in 2007 I got a couple of 12ft boards to give a wider perspective to our store display. Later that summer I decided to take the boards (along with a friend of mine) onto the River Thames at Hampton Court to see how they would cope. This was like a ‘cartoon light bulb’ going off in my head. SUP was an inland sport more than a surf sport. From that day, I have been SUPing two/three times a week – mostly on rivers, streams and lakes with the occasional trip to the coast. 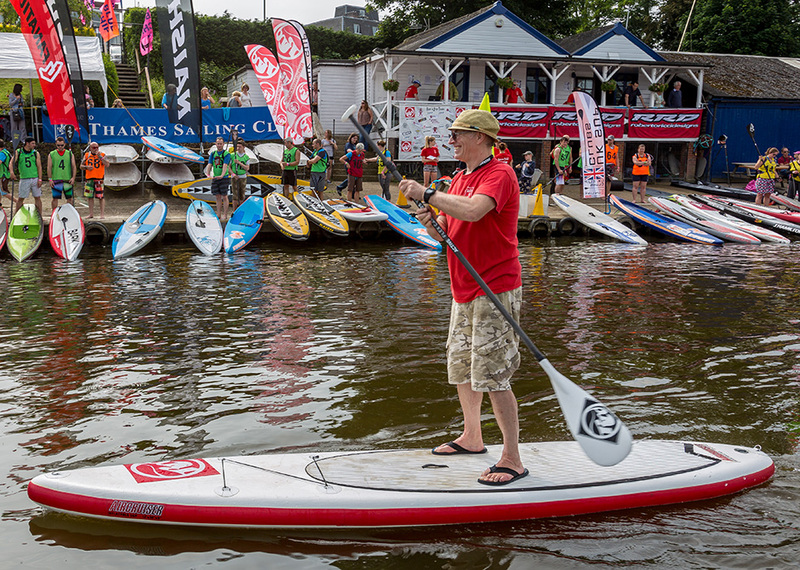 Why do you think SUP appeals to people – what is it that makes stand up so addictive? Today’s lifestyle is more and more about instant results and gratification and SUP fits the bill. SUP is a very low impact, sociable sport requiring very little equipment; a paddle, board and leash. You don’t need to buy a starter board and then upgrade to an intermediate board and then upgrade to a performance board. For many paddlers, their first board can be their only board for several years. Running a retail outlet (Blue Chip) is a full time job so what made you decide to set up a SUP club as well? The SUPer Club was just a natural extension of a group of like minded paddlers. In 2009 we started to call ourselves The Blue Chip SUPer Club. In 2013 we formalised the club into a members non profit making club. Were there any hurdles you had to jump at the club’s inception? How easy did you find it starting something new and attracting members? The Blue Chip SUPer Club basically started itself (like most good clubs). Attracting new members doesn’t seem to be a problem at the moment. How many paddlers do you get turning up to your club nights and what benefits do they get by being part of the Blue Chip SUPer Club? We have about ten members that attend most of the paddles and we also have 385 paddlers on our notification list. This means that we get about four-six more that can attend a particular paddle at a particular location on a given date. Is attracting new club members difficult or do you find paddlers discover you for themselves without the need for promotion? Word of mouth and our unique illustrated paddle blog found on our website: http://www.BlueChipSUPerClub.co.uk. We have now had over 185,000 viewings of the blog. 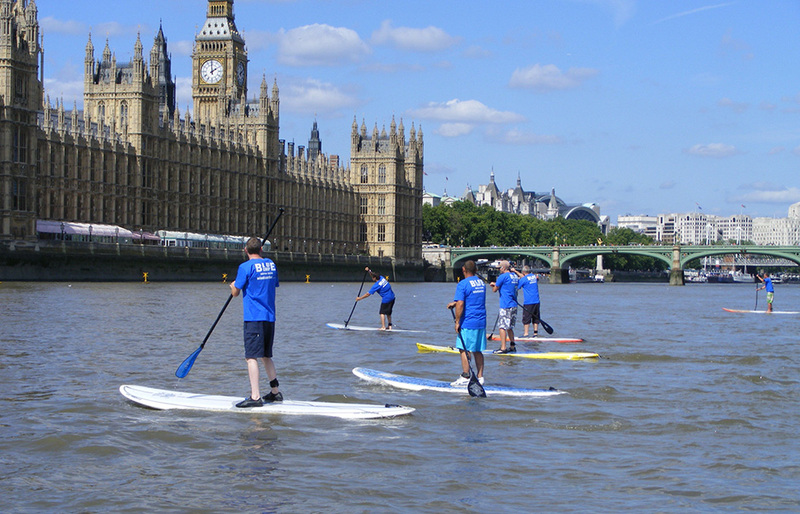 You normally paddle on inland waters, such as the Thames. What makes these locations so good for stand up paddle boarding? We like to call our paddles ‘Adventure Paddles’. We are blessed with some superb locations in our area and we also have a really great home water base on the Thames at Kingston/Surbiton. Recreational / adventure paddles are what the Blue Chip SUPer Club is all about and has been since 2009. The only way you will find out why we have such great fun on our local locations is to join in one of our Wednesday paddles. Why do you think SUP clubs are important and how do they contribute to the stand up paddling industry as a whole? Are clubs the only way to grow the sport in the UK? I don’t know if SUP Clubs are important or if they are helping to grow the sport in general. Blue Chip Board Store has a unique approach to retailing, none of us are salesmen, but we are all SUP enthusiasts with a depth of knowledge few can match. I see my role as passing on my enthusiasm and knowledge of the sport. This certainly helps with the unrivaled success of the Blue Chip Board Store. Knowledge and experience is a huge part of our success to become the largest SUP Store, SUP school and SUP Club in the UK. I am also the first ASI SUP instructor in Europe and the Blue Chip SUP Store is the first ASI accredited SUP school in Europe. Tell us about the Battle of the Thames event that’s now an annual and highly anticipated get together. How did you come up with the idea and what’s it like to organise? BOTT or Battle of the Thames started four years ago and derived from an idea I had to have a race along the Thames and to be all inclusive of paddler and board categories. With such a wide spectrum of entries, it does produce some challenges with admin and time keeping. Having said all that, the event does seem to have captured the imagination of the SUP community and has also produced a great BOTT admin crew whose expertise are now called on at many other SUP events. Last year’s BOTT attracted 140 entries. How do you see the event growing? You’ve suggested in the past that you may want to expand the concept – can you tell us how you plan on doing this? I think the racing side of BOTT is now well established and on a sort of auto pilot growing in numbers year on year. For next year I will be introducing a BOTT cruise which will take place before the main race. The BOTT cruise will take in Hampton Court Palace, Hampton Court Bridge and the Golden Gates of the palace grounds. The BOTT cruise will be for those that want to be part of BOTT without actually racing. Details are yet to be finalised. Do you find Blue Chip SUPer Club members enter many races (or other events) or do they tend to stick with recreational paddling? The Blue Chip SUPer Club is primarily a SUP adventure / social paddling club. We have some members who take part in other race events and some that help with our expertise in the time keeping roll. Blue Chip also organise the popular Inflation Day demo day. Why did you choose to lay on an event based purely on inflatable SUPs? Do you find more people buying iSUPs through your shop or is it a mixed bag? Inflation Day: this is another great and well attended event. 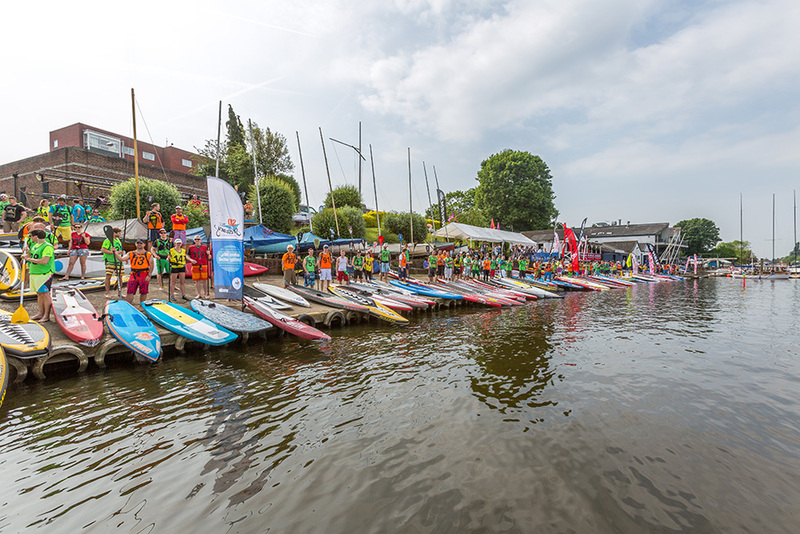 2014 saw over 60 inflatable boards at the waters edge for demo and we had 120 paddlers register on the day. Blue Chip embraced the inflatable concept from when they were launched in the UK. 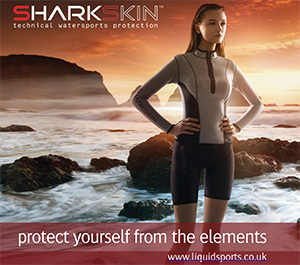 For the last few years we have been the largest iSUP supplier in the UK. Nothing replaces experience driven knowledge and our customers really appreciate the benefit of our experience with iSUP boards. We test drive every model of iSUP that we are asked to retail and the only ones that go onto our shelves are the ones that come up to our standards. Do you have any other events in the pipeline? Yep, but you will have to wait until next year to hear all about them. Back to your club nights and how are they generally structured? Do you have a route in mind before the date or is it a more relaxed affair? We have a very relaxed theme to our paddles – adventure, social and re-hydration. The guys call me ‘Route Master’, mainly because they rely on me to pick the route, time and re-hydration stop. 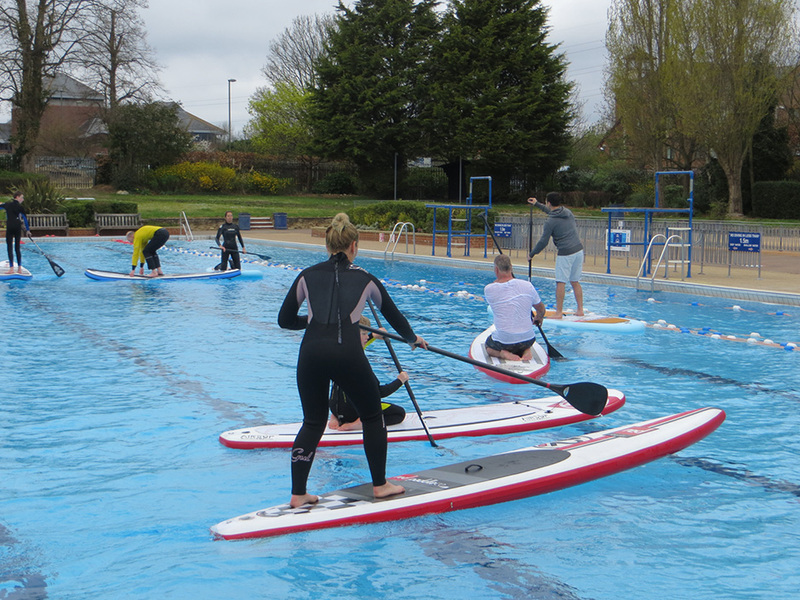 Is there any stand up paddle training available to Blue Chip SUPer Club members and if so how do you run these sessions? 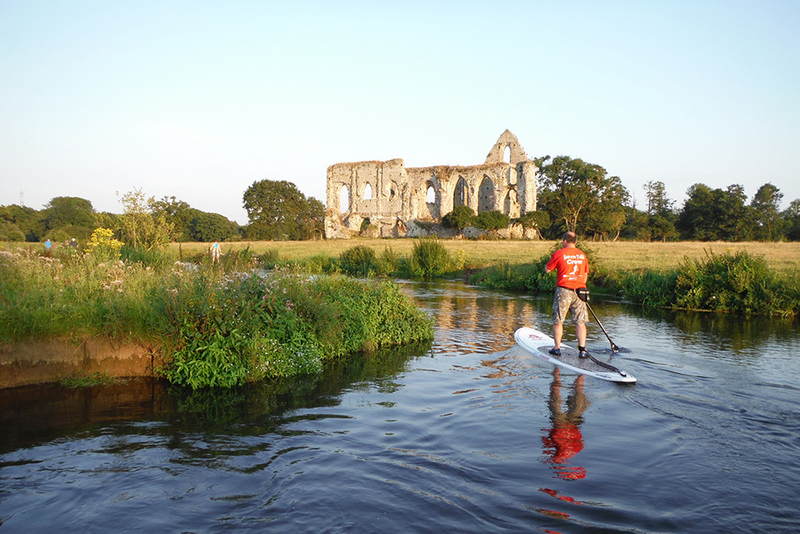 The paddle training takes place mainly during the winter months at the lake or on the River Wey. These paddles are in complete darkness so you rely on the feel and sound of the paddle stroke which really helps. How often does Blue Chip get to the coast? Are any of your members into surfing, for instance, or downwind paddling? Downwinding is something that we all are looking forward to but our difficulty is to make a date in advance when the conditions will be right. Having windsurfed for over 30 years and then on to SUP, it feels a bit like going backwards. Downwinding must be great if you live close to a suitable area, you can just go when the conditions kick in. As more and more stand up paddle boarding clubs start up how do you see the scene evolving in the UK? Do you think we’re on the cusp of SUP being a huge sport or will it remain low key? That’s a difficult one to call. It all depends on how much effort is put into the event scene. Nothing attracts people to SUP like SUP. Can paddlers in the UK keep up with overseas talent? Could clubs be a way of nurturing those who show promise and help prepare them for international competition? I think the UK SUP Clubs has made great strides, in just one year, into developing a great national race scene along with encouraging new racing talent in the UK. How much of your own personal time do you dedicate to the club and helping to raise awareness of SUP in your area (or further afield if applicable)? You have to live SUP to be successful and to live it, you first have to know it, understand it and then you can’t help but to love it. I have been in the watersports industry since 1974 – I started Blue Chip Board Store in 1980. In the late 80s and early 90s I organised some of the largest customer windsurfing holidays ever culminating in 75 windsurfers and 1.5 tones of equipment flying out to Safaga for a great trip. I started the Blue Chip SUPer Club in 2009 and now have over 375 paddlers on our notification list. 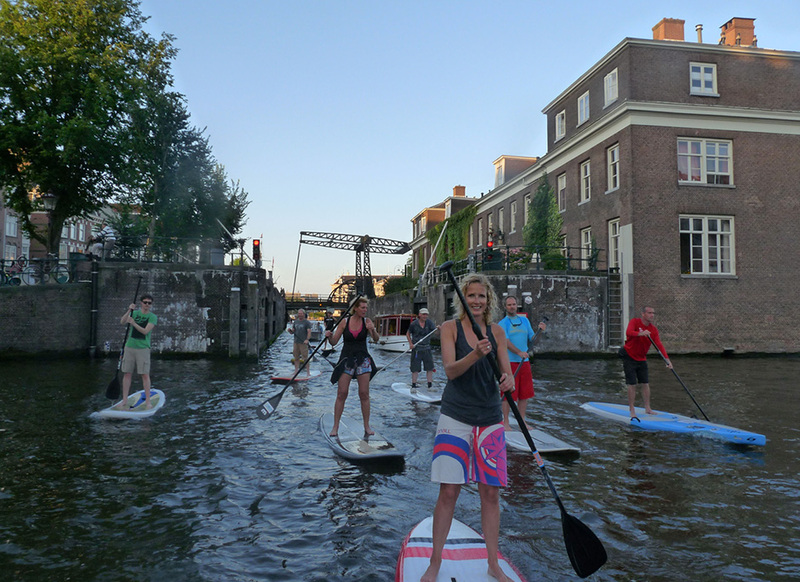 We were the first UK SUP club to paddle through Amsterdam. You asked how much of my personal time do I dedicate. I would say about 100% or so? Any final words regarding stand up paddle clubs or UK SUP in general?